Home > Big Internet Companies > How Big is eBay? The king of the auction sites where the Internet is concerned is undoubtedly eBay. If you have not visited eBay before and are looking for a bargain then it is worth a look. In fact, eBay is probably a thorn in the side to a great number of "real world" business both large and small. It is certainly a great place to grab a bargain and a great place to find goods you would not be able to find in the high street. The site is now so big and has so many categories to choose from that even rare items or difficult to obtain items can usually be found in their pages. eBay sell just about everything to everyone and offer "borderless" selling. In other words, you can sell goods and services via eBay to anyone in the world who wants them. Ever since it sold a broken laser light for $14.83 (now banned on eBay) as its first item, following its formation on September 3rd, 1995, it has been selling and trading in cyberspace. It was founded in San Jose, California, but back then it was known as AuctionWeb. It was not even an auction site in its own right however, as it was just a part of a larger personal site. It's founder, computer programmer Pierre Omidyar a French born Iranian added articles to the site of general interest. By 1997, the site had received a boost in the form of venture capital to the tune of $5 million from providers Benchmark Capital. 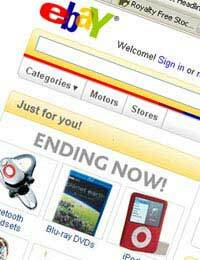 eBay the auction site was born after a name change in September 1997 from AuctionWeb. However, eBay could quite easily be known today as "Echo Bay", as the site originally belonged to the Echo Bay Technology Group, who were Omidyar's consulting company. The problem was the domain name was already allocated to Echo Bay Mines who were a gold mining concern, so eBay, the second choice of name was chosen. The site gathered more interest when a public relations manager fabricated a story that eBay was founded in order to help Omidyar's fiancée sell PEZ Candy dispensers. The media, and subsequent interest in the site really took off. The fabricated story may have had something to do with it, but in all likelihood the site probably became more popular at a time when online auctions were a relatively new concept, and unusual items such as the broken laser gun could be acquired from the site when they could not be obtained anywhere else. By the way, the buyer of the broken laser light was a collector! Progressing to early 1996, and the first employee named Jeffrey Skoll was made president of the company. One of the first deals eBay did with external third parties was to enter into a licensing deal with a company named Electronic Travel Auction, who utilised the use of SmartMarket Technology to provide plane tickets and numerous other travel products. Omidyar and Skoll became instant billionaires as eBay went public in September, 1998. Paypal, their current credit card processing company were purchased in October 2002. The rest as they say, is history. eBay now sit alongside other Internet greats such as Google, Microsoft, Yahoo! and other famous companies who became well known in the early days of the Internet. In almost all cases of sites like these, during the .com bubbles of the early 1990's many millionaires and billionaires were created due to new concepts and websites which later became a hit. eBay is one of those sites.